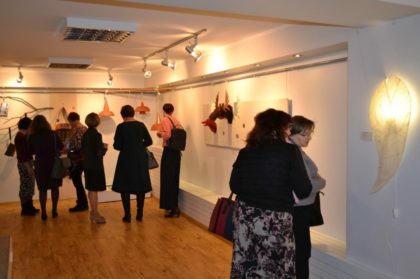 The project is targeted at local artisans (80 persons) working with textile, glass, wood, ceramics and paper that are seen as potential entrepreneurs in the Latvian-Lithuanian cross border area, namely, Dobele municipality and wider Zemgale region in Latvia and Anykščiai district municipality and Panevėžys county in Lithuania. The project is designed to tackle the two common challenges faced by the artisans – (1) development of a competitive product and (2) finding and entering new markets for selling it. 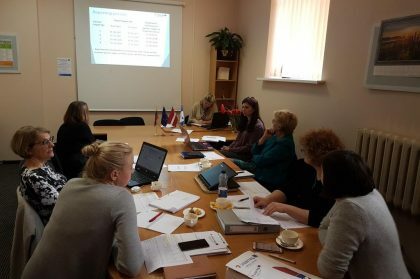 The overall objective of the project is to create employment opportunities by development and improvement of the cross-border business environment in the Latvia-Lithuania cross-border area through actions encouraging and supporting local artisans to develop new business ideas and initiatives in the field of creative craftsmanship and start their own business. This will be done through development of business support model, as well as series of theoretical trainings and practical creative workshops designed specifically for artisans. The project will promote creativity and through thinking and doing design create new and improve the existing products developed by artisans as potential entrepreneurs. 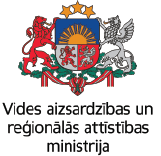 It is intended that out of the 80 artisans participating in the project activities, ~50 will develop new business ideas and products and eventually establish their own businesses – with a few Latvian-Lithuanian joint ventures. 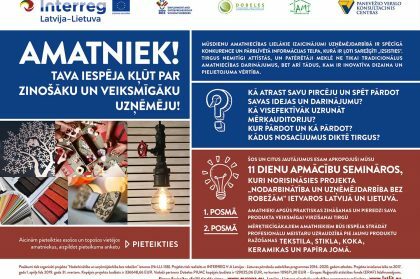 Straujiem soļiem tuvojas projekta “Nodarbinātība un uzņēmējdarbība bez robežām” (LLI-138) noslēgums un droši varam teikt, ka lepojamies par mūsu amatnieku radītajiem darbiem un projekta veiksmīgo norisi. 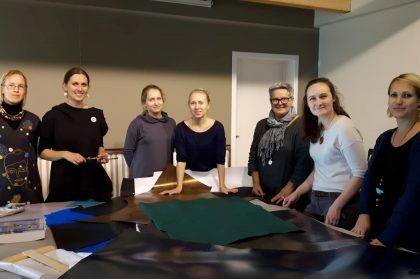 Textile workshops were held in Anyksciai art incubator – art studio on 25-27 th of September. Lector of Vytautas Magnus University Faculty of arts Rita Kaupelienė moderated workshops and helped participants on their creative activities all three days. 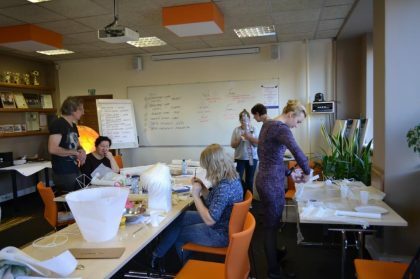 6 participants took place in workshops from Lithuania and Latvia. 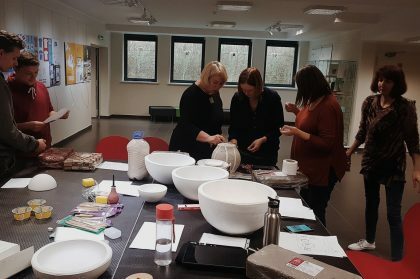 Ceramic workshops were held in Anyksciai Art incubator – Art studio on 18-20 th of September. Lector of Vilniaus art academy Laima Mikalauskiene moderated workshops and helped participants on their creative activity all three days. 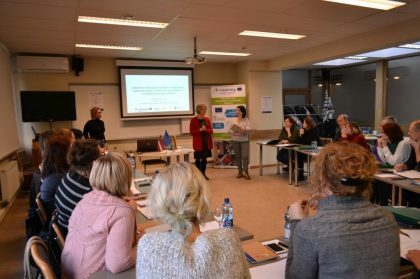 6 participants took place in workshops (2 from Anyksciai, 2 from Panevezys and 2 from Dobele). After inclusive part of artisan trainings in Dobele, Panevėžys continues with their part. At the end of March 2018 training process in Panevėžys is coming to the end. 3rd module „Creation of brand / branding” (2 days) and 4th module „Market research and marketing for new markets” (1,5 days) with lecturer Renata Žvirelienė are already done. The craftsmen listened to the theoretical material that was relevant to the creation of the brand and market research, performed individual and group practical tasks. Dobeles Pieaugušo izglītības un uzņēmējdarbības atbalsta centrs (turpmāk tekstā Dobeles PIUAC) šī gada 1.aprīlī uzsāka realizēt projektu “Nodarbinātība un uzņēmējdarbība bez robežām” (Nr.LLI-138). Šiandien naujosioms technologijoms aktyviai keičiant senąsias tradicijas, vis daugiau sentimentų sulaukia rankų darbo gaminiai. Keičiantis ekonominėms ar gaminių paklausos rinkoje sąlygoms atsiranda niša smulkaus verslo vystymui, o stambesni verslininkai yra priversti permąstyti verslo perspektyvas ir pasiryžti įgyvendinti kūrybines iniciatyvas. Aicinām pieteikties amatniekus projektā “Nodarbinātības un uzņēmējdarbība bez robežām”. 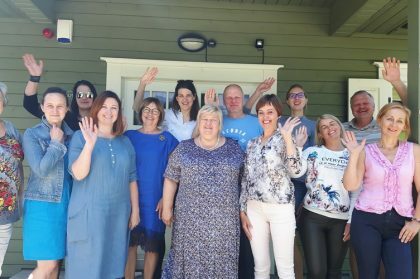 Projekta mērķis ir pilnveidot un uzlabot Latvijas-Lietuvas pierobežas biznesa vidi ar tādu aktivitāšu palīdzību, kuras stimulētu vietējos amatniekus attīstīt jaunas biznesa idejas radošās amatniecības jomā, lai uzsāktu savu uzņēmējdarbību. Projekts ir veidots, lai risinātu divas galvenās problēmas, ar ko saskaras amatnieki – konkurētspējīga produkta izveide un jaunu noietu tirgu atrašana. Amatniecība ir mazās uzņēmējdarbības veids, kas izmantojams ikvienam cilvēkam, kuru interesē kāds konkrēts amatniecības nodarbošanās veids, gan nelielai lauku saimniecībai savas darbības dažādošanai. Latest Facebook activity - Craftsmen of the project "Entrepreneurship without Borders"
NETWORKING EVENT "CREATED IN THE CROSS-BORDER AREA"